Los Angeles, CA - (January 2012): Where heavymetal meets rocker chic, China Glaze® introduces the Spring 2012 collection, ElectroPop. 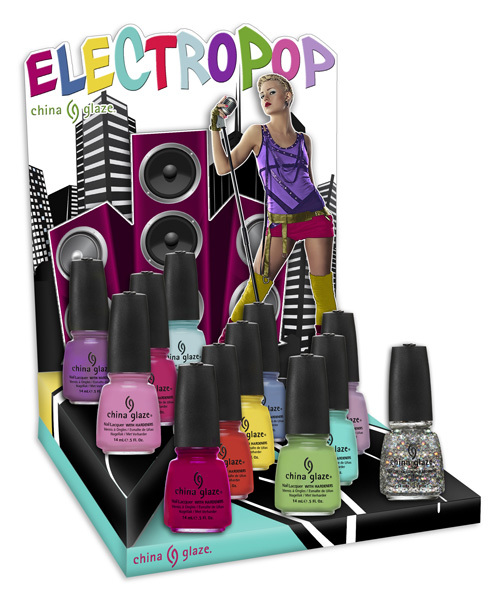 Inspired by all things girly,edgy and fun, the 12 shades of ElectroPopbring out the inner rock star in all. For flash and glam this spring, ChinaGlaze® hits the stage in style! ElectroPopwill be available February 2012. Individual shades retail for $7; 6 piece collections retail for $42. China Glaze is a divisionof American International Industries. For nearly 40 years, AIIhas been the leading manufacturer and worldwide distributor of innovative,quality beauty and skin care products for men and women. Our productlines include Ardell, Andrea, Body Drench, Bye Bye Blemish, Checi, China Glaze,Clean + Easy, Clubman/Pinaud, Duo, European Secrets, EzFlow, Fright Night, Gena,GiGi, Gypsy Lash, IBD, Jeris-Lustray, No Tweeze/Micro Tweeze, 'N Rage, Prolinc,RAW, Seche, SuperNail, Surgi-Care, Waterworks, Winning Nails, Woltra,Woody’s, and Youthair. For more information, visit our website: www.aiibeauty.com. I love China Glaze and this collections is beautiful,I said that i wont buy nailpolish anymore but i am afraid that if this collection hits the dutch webshops i will have to get my bankcard out..